Pain is a somatic and emotional sensation which is unpleasant in nature and associated with actual or potential tissue damage. Physiologically, the function of pain is critical for survival and has a major evolutionary advantage. This is because behaviours which cause pain are often dangerous and harmful, therefore they are generally not reinforced and are unlikely to be repeated. The classification of pain is complicated and there are many different types of pain, each arsing through unique mechanisms. Types of pain include: sharp pain, prickling pain, thermal pain, aching pain. In addition, the origin of pain can be somatic, visceral, thalamic, neuropathic, psychosomatic, referred or illusionary. Pain can also be acute or chronic in nature. This article will provide a general overview of a ‘classic’ picture of pain i.e. the pain we feel when we stub our toe or touch something sharp. It will focus on how the pain pathway is initiated and processed within the spinal cord. First order neurons – These are pseudounipolar neurons which have cells bodies within the dorsal root ganglion. They have one axon which splits into two branches, a peripheral branch (which extends towards the peripheries) and a central branch (which extends centrally into spinal cord/brainstem). Second order neurons – The cell bodies of these neurons are found in the Rexed laminae of the spinal cord, or in the nuclei of the cranial nerves within the brain stem. These neurons then decussate in the anterior white commissure and ascend cranially in the spinothalamic tract to the ventral posterolateral (VPL) nucleus of the thalamus. 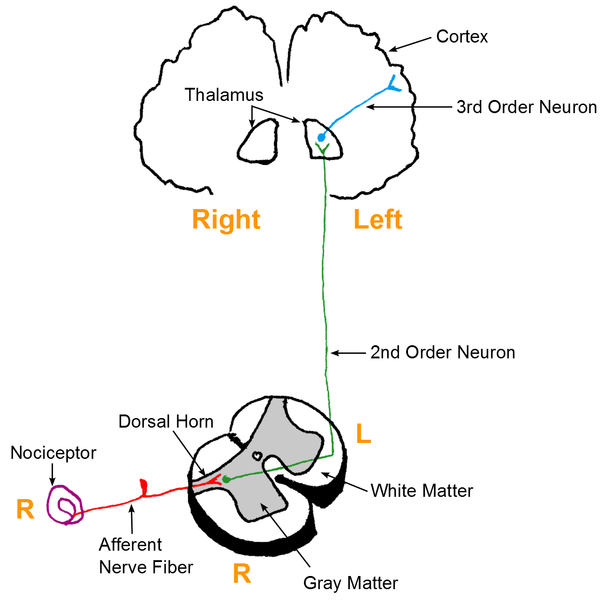 Third order neurons – The cell bodies of third order neurons lie within the VPL of the thalamus. They project via the posterior limb of the internal capsule to terminate in the ipsilateral postcentral gyrus (primary somatosensory cortex). The postcentral gyrus is somatotopically organised. Therefore, pain signals initiated in the hand will terminate in the area of the cortex dedicated to represent sensations of the hand. The above is a simplistic generalisation for the pain pathway, however a more detailed model is beyond the scope of this article. Fig 1 – A diagram demonstrating the simplified general pathway of nociception. Some first order neurons have specialist receptors called nociceptors which are activated through various noxious stimuli. Nociceptors exists at the free nerve endings of the primary afferent neuron. Since nociceptors are free nerve endings this means they are unencapsulated cutaneous receptors. This is opposed to encapsulated cutaneous receptors (e.g. Merkel’s discs) which detect other sensory modalities such as vibration and stretching of skin. Similar to other sensory modalities, each nociceptor has its own receptive field. This means one nociceptor will transduce the signal of pain when a particular region is skin is stimulated. The size of receptive fields vary throughout the body and there is often overlap with neighbouring fields. Areas such as the fingertips have smaller receptive fields than areas such as the forearm. In addition, they have a larger density of free nerve endings within this receptive field. This difference is important as it allows for greater acuity in detecting a sensory stimulus. The size of cortical representation in the somatosensory cortex of a particular body part is also related to the size of the receptive fields in that body part. For example, because the fingertips have small receptive fields, and thus a greater degree of sensory acuity, they have a larger cortical representation. Signals from mechanical, thermal and mechano-thermal nociceptors are transmitted to the dorsal horn of the spinal cord predominantly by Aδ fibres. These myelinated fibres have a low threshold for firing and the fast conduction speed means they are responsible for transmitting the first pain felt. In addition, Aδ fibres permit for the localisation of pain and form the afferent pathway for the reflexes elicited by pain. Aδ fibres predominantly terminate in Rexed laminae I where they mainly release the neurotransmitter glutamate. Polymodal nociceptors transmit their signals into the dorsal horn through C fibres. C fibres are unmyelinated and a slow conduction speed. For this reason, C fibres are responsible for the secondary pain we feel which is often dull, deep and throbbing in nature. These fibres typically have large receptive fields and therefore lead to poor localisation of pain. Compared to Aδ fibres, C fibres have a high threshold for firing. However, noxious stimuli can cause sensitisation of C fibres and reduce their threshold for firing. C fibres predominately terminate in Rexed laminae I and II and release the neurotransmitter substance P. Other neurotransmitters are released by primary afferent neurons terminating within the spinal cord such as aspartate and vasoactive peptide. Many of these factors are also proinflammatory and lead to acute inflammation in the area of damage. 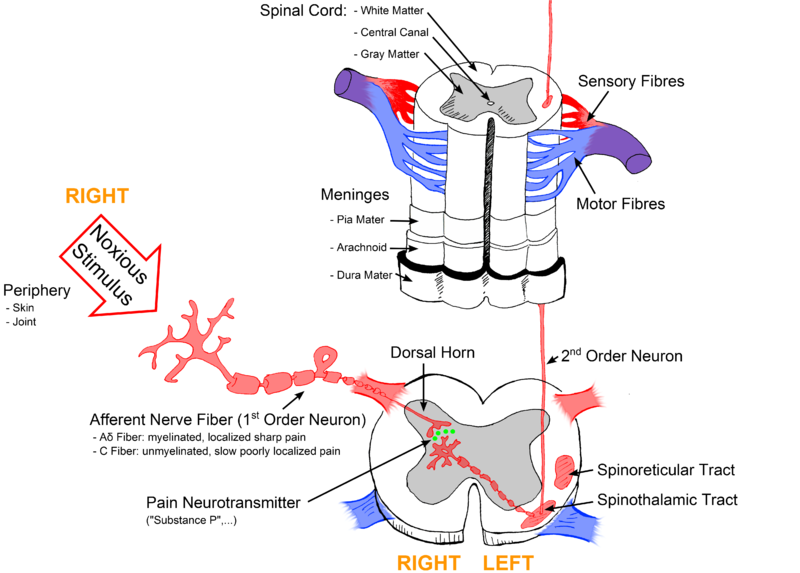 Fig 2 – This diagram is a more detailed representation of the pain pathway, showing the different afferent fibres and neurotransmitter release within the dorsal horn. Hyperalgesia describes the phenomenon where there is an enhanced sensation of pain at normal threshold stimulation. The pathophysiology of hyperalgesia is believed to arise from the sensitisation of nerves in and around the damaged area due to the release of molecules such as prostaglandin E2. In addition, free nerve endings release substance P which acts on surrounding cells causing them to release molecules which potentiate pain. Sensitisation means that these nerves have a reduced threshold for firing as a result of noxious stimuli. Sensitisation can also occur centrally within the spinal cord. The pathophysiology is thought to arise from an increase in number of NMDA receptors, as well as increased sensitivity of NMDA receptors to glutamate. These changes occur on the dendrites of second order neurons and are a result of prolonged glutamate release from first order neurons due to persistent nociceptor activation. Central sensitisation leads to hyperexcitability of second order neurons within the dorsal horn of the spinal cord. Allodynia is where pain is felt on a stimulus which was previously not painful. Allodynia is also observed in and around areas effected by noxious stimuli. Hyperalgesia and allodynia are features of a physiological response to pain but can also be observed in pathology. For example, neuropathic pain is characterised by hyperalgesia, allodynia and spontaneous firing of nociceptors due to nerve damage. Within the central nervous system there are three types of opioid receptors which regulate neurotransmission of pain signals. These receptors are called mu, delta and kappa opioid receptors. Opioids can regulate pain on a number of levels, both within the spinal cord, brain stem and cortex. Within the spinal cord both dynorphins and enkephalins can act to reduce the transmission of pain signals in the dorsal horn. This is because the pre-synaptic ends of second order neurons have opioid receptors within the membrane. In addition, the post-synaptic end of first order neurons contain opioid receptors. When endogenous opioids act on these receptors it reduces neurotransmitter release from the first order neuron, and causes hyperpolarisation of the second order neuron. Together, this reduces the firing of action potentials in the second order neuron, blocking the transmission of pain signals. The WHO has produced a step wise process for managing pain. There are 3 steps in this ladder, whereby if pain is not controlled a patient will progress on to the next step.